This is one of my favourite products from Paula's choice. I have sensitive skin with slight rosacea on the cheeks so am always prone to redness / skin 'bumps'. My skin struggles with Retinol (in high concentration) and BHA liquid exfoliants but this product has completely changed my skin. I use it at night as part of my routine and it works wonders - redness is diminished and old scars / marks have disappeared. It did make my skin tingle when I first started using it but this stopped after a few weeks of using. I would recommend to anyone who struggles with exfoliants to give this a go. I am sorry to say this but it is the worst product of Paula's choice that I've ever tried. I do not normally have sensitive skin, but this product makes my face feel itchy and prickly and causes breakouts which I never had with other products. I have given it a try by applying it every other day, but as soon as it came into contact into my face, I causes itchiness. It's just not for me. Customer Care: Thank you for sharing your experience with us. Although this is not a common response, we do understand that each customer is uniquely different in how they will respond to products or ingredients. We're sorry to hear this didn't work as expected for you! Please contact a member of our Customer Care team should you like to discuss your routine. If you have spots and or marks from old spots, add this to your basket now! I got my order 2 days ago and my skin looks amazing right now and hasn't looked this good before. I know it was this product because the other product I ordered I've used before and its great but this just kicked it up a notch to perfection. It tingles slightly and feels moisturising but not heavy, just smooth and soft. Honestly its perfect! Thank you so much for creating this! This product is amazing. It does exactly what it promises to do and gives the skin a smooth, flawless texture. I have used this product for a few years but recently became bored and so purchased one of the creams 'from the sea', which is 4 times as expensive. My pores started getting clogged and I developed milia. Within two weeks of switching back to PC, I have started getting compliments about my skin, as I used to. The other good thing about this brand is that they don't bombard you with emails after purchase requesting reviews, meaning that any reviews are genuine and unsolicited. This brand has simplified and revolutionised my skin care routine. I wish it had been around in my troublesome teens and twenties. I use this product every night after taking off my make up, and even without using toner and moisturisier this product has proven to be the only thing I needed. Great evenly toned skin, baby soft, will repurchase. Victoria - Will never be without this! I have sensitive combination skin and have really struggled to find something to balance my skin and eradicate hormonal acne. I had regular breakouts, especially at pre menstrual times. I've been using this product twice (sometimes once) a day for the past 8 weeks and my skin is virtually spot free. I no longer feel I need moisturiser on a morning as it leaves my skin really comfortable after cleansing and is a perfect base for my foundation. It's quite pricey but I no longer need some of the products I used to use and it seems to be lasting a while. Plus it works so well which makes it worth the price tag for me. I have a few dark spots and light melasma on my forehead and it has reduced a little but not as much as I hoped for. Regardless, I still think it is a wonderful product for anyone who suffers from regular breakouts. I would not be without it now! I love this product, I'm on my 3rd tube and will never use anything else. I have very sensitive, acne prone skin and my skin was breaking out like mad. the make up artist Lisa Eldridge recommends this on her youtube channel so had to try it, I'm not disappointed! I recently had a week between finishing the last one and receiving my next one, my skin was so much better once I added this back in. my whole skin care is PC which works great but this is the x-factor in the range. will be buying for the rest of my life! I tried this product after Lisa Eldridge recommended it for acne prone skin and my skin is much better after using it. My skin is much more even, and while I do still get spots, it's not as frequent or as bad as it was. Please never stop making it. Very nice texture- white and creamy absorbs well into the skin. No residue. Seen improved results with texture would buy again and recommend. I do not have sensitive skin and rarely react to products, but I persevered for 10 days now and I need to stop using this. All around the eye area my skin is very red and sore. Being a woman of colour, I was quite sceptical about using this product. I have used a dermatologist for over 10 years but wanted to switch to something more easily accessible and affordable for my skin. Pigmentation, especially around my eyes, has been a major issue for me and I'm glad to say that this product combined with the Weekly 10% AHA Treatment has transformed my pigmentation and overall complexion. Admittedly you do not get overnight results but with patience and continued use - I am pleased to say that I can see a massive improvement over the last two months. Just a quick note to say that I did speak with the PC customer services team beforehand who noted that this may not work as well for very long standing issues so that helped to manage my expectations - although this product has definitely exceeded those! Well, I don't know if it's this product or the vitamin C one but my skin looks better than it has for years. I have spent so much on high end department store products for years and some created as many problems as they tried to help. I switched to PC products 2 weeks ago and I am very very impressed. Amazing results, big improvement in texture, tone and everything else. Every aspect of my skin has improved. I am going to age gracefully afterall! Thank you thank you Paula's choice! I was sceptical at first as I have some stubborn dark patches around my eyes and did not want to spend over £30 on a serum. However, as I know that Paula's Choice do not make plain promises I gave this a try and am not going back. The patches obviously did not disappear overnight but I feel my skin is smoother, brighter and happier-looking. This Correction serum combined with BHA exfoliant is a definite winner! I like this product a lot!!!! I just have a question about how to use it) so I have this product and also the Ultra Light Super Antioxidant Concentrate serum for normal/oily skin. Which one should I use first??? Thank you!!! Customer Care: Thank you for your review. We recommend to first use the Resist Multi-Correction Treatment (after cleansing/toning/exfoliating), then follow with serum and/or moisturizer. I bought this because I wanted an all-round product that tackles acne, discolouration and uneven skin tone. I haven't been using it long enough to know if it will fade dark spots, but I'm already thrilled with it after a few uses. It feels very comfortable and hydrating on the skin, and hasn't irritated my sensitive skin at all (2% salicylic acid irritates my skin, as does any glycolic acid). My skin looks noticeably more even and spot-free - normally I wear concealer on a daily basis but I've been leaving the house with only a tinted moisturiser because my skin looks so clear! I've never found a product so gentle that has such a great result. I hope this is never changed or discontinued because it's perfect. I have melasma and couple of old spot marks.i have been using this product since April religiously and have not see any improvement. I really hoped it would work but total waste of money! This is an absolute wonder product. Initial thoughts were that it wasn't working, and could be a tad 'stingy' in certain areas like the eyes. After a few weeks I've really noticed a gorgeous consistency to my skin tone in the morning, less spots and break outs and possibly some slight fine line relief, although I don't think anything comes close in real line busting treatment. My only concerns was about the skin lightening aspect of this serum as I like to use gradual tanners and envisaged waking up looking ghostly and bleached, but I haven't noticed anything too bad at all. Maybe a little pricey, but it certainly works and I'm just about to re-order now. I've ordered this serum based on positive reviews here and Lisa Eldridge mentioning it as her HG treatment. I really like the texture of the serum and the result I get from using it twice a day but I can't stand the smell. I wish it could be more pleasant to use but then again it seems to be working well with my blemish prone skin so I guess I'll keep using it. The other thing I've tried applying it after 2% BHA liquid exfoliator and my skin didn't like it at all so now I use exfoliator in the morning and this serum at night. So far so good. I think this is an excellent product. It really seems to reduce redness and irritation and to keep skin clear. More and more I'm convinced that I only get acne flare ups (read normally one huge cystic lump that make me want to stay indoors) as a result of irritation. I've stopped using benzyl peroxide now entirely. It seems to be slowly clearing the red marks left by those enormous red cysts which is amazing. This is expensive (for me) but absolutely worth it (for me!). Nothing to do with the product but I do battle with only being able to get products online. Personally I find it frustrating in the extreme. I seem to be in a minority here as other clearly have no problem. I look forward to the day when these products can be purchased from a bricks and mortar shop. This product has quickly become a must-have for me! It was a little irritating to start with, but after using it every other day for a couple of weeks I'm able to tolerate it once or twice a day. 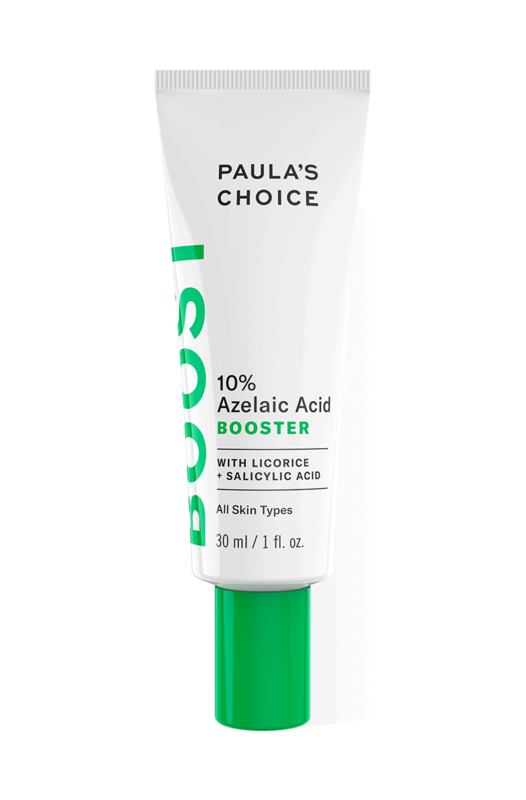 The Azelaic Acid does a great job of evening the blotchy skintone and blemishes I get from rosacea, as well as slowly reducing the appearance of old acne scars. Despite being quite a heavy lotion, it doesn't make my skin any more oily, which is an added bonus! My only problem for me is the price - as with many PC products, it's very steep for the amount of product you get. I can justify buying it because it helps my skin so much, but if there was a comparable product available elsewhere for less, I would probably buy it. I found this product okay to use. I was looking for an alternative for Benzoyl Peroxide, as i find it quite drying even with an emollient moisturiser, so i thought this could be it. The first few times i used it (daily use), it reduced redness, and inflammation, and i thought i'd finally found a replacement. After a week it started to have the reverse effect and started to break me out, first a little, then more appeared. I know it wasn't a coincidence as i only used this product on a small section of my face and that's where the breakouts started happening. I think it maybe the BHA in the product, and could be too much for skin as i already use BHA toner (normal strength - a higher ph), i'm not sure. I'm exploring the possibility of using a pure azelaic acid treatment from the doctors. I need something to use everyday to keep my acne at bay. The positives for me however, i use this product after i shave, as i only shave once a week, this product helps with razor rash, and redness. Another positive, don't be fooled by the tube size, it lasts quite a while, impressed with longevity.